New York resident John Copeland was shocked when he was nabbed by the police for having a folding knife with a three-inch blade that he bought from a reputable sports store in New York City. Apparently, police wrongly deemed this knife and many other folding knives an illegal gravity knife, according to the New York Post. So, what’s the best way to get a city to address the problem? Sue them. 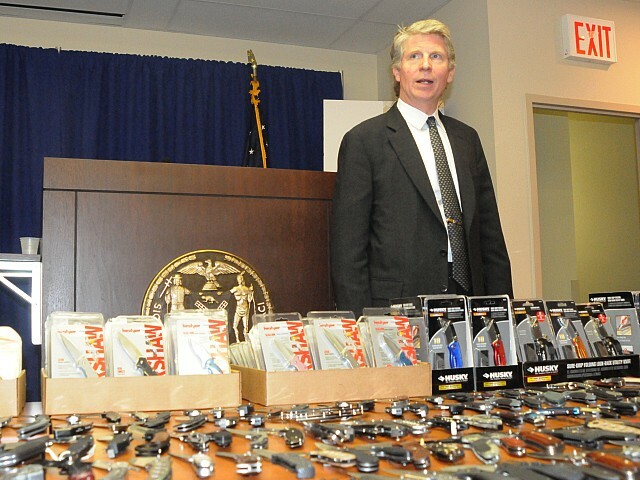 Knife Rights, the non-profit knife advocacy group from Arizona, has filed a civil rights lawsuit on behalf of Copeland and another man against New York City District Attorney Cyrus Vance Jr., who has been on a yearlong crusade to remove knives from the streets. The only problem is, Knife Rights claims that Vance and police are wrongfully identifying any knife that’s easily opened with one hand as gravity knives. Copeland’s case was dismissed after they settled on a community service deal and a fine. Knife Rights is not looking for monetary compensation, but is merely seeking a ruling from a federal judge on their perceived misuse of penal codes. They are also looking for a clear definition of gravity knives. About a year ago, Vance pressured Home Depot, Paragon Sports and Eastern Mountain Sports to stop selling knives that loosely fight the definition of gravity knives by threatening them with hefty fines, according to DNAinfo. With the pressure of this civil rights lawsuit now on Vance, city lawyers say there is no merit to the case and are confident of a swift victory. What is considered the definition of a gravity knife? Why don’t u go after the problems illegal aliens, rapists drug dealers,etc.